[AUTO](VC) Limit Break 4 (This ability is active if you have four or more damage):When this unit attacks a vanguard, this unit gets [Power]+5000 until end of that battle. [AUTO]:[Counter Blast (1)] When this unit is placed on (VC), you may pay the cost. If you do, choose a face up «Angel Feather» from your damage zone, call it to (RC), and put the top card of your deck face down into your damage zone. Kiriel is a pretty decent card. She gets you exactly what you pay for - one card for two counterblast, the most standard cost to reward ratio in the game. That said, it's really only a wash, since she requires you to ride her to use this effect. That isn't necessarily a bad thing on your first ride, since riding is important so it is a wash of a minus that you would have incurred anyway. However, this somewhat limits her usefulness, since re-riding her doesn't actually gain you any advantage. It could give you indirect advantage - riding her and superior calling a grade 2 where you would normally have put your extra copy of Kiriel, gaining 5k more shield than you would otherwise have, for example. The usefulness of her ability is hindered quite a bit by her lack of choices, though; the best time to use her effect is when you ride to grade 3 the first time, and you want to take as little damage as possible early game, but ironically Kiriel's usefulness is directly related to how much damage you've taken. Her limit break is also pretty standard; a power boost of one stage for every attack he does late game. This is nice, as usual, because you don't even really need that extra power until late game anyway, so the limit break stipulation is not even really an issue. So, overall, Kiriel is an example of a good but average card with more limitation than is necessary. [AUTO]:[Counter Blast (1)] When this unit is placed on (VC), you may pay the cost. If you do, choose a face up «Angel Feather» from your damage zone, call it to (RC), and put the top card of your deck face down into your damage zone. With that said, what happened to all of the Angel Feather players? Well, they are a bit salty now seeing how they didn't think that Angel Feathers were as good as they thought they were when really, it should be played as a high defense deck...but that's just me, and that's where this card sort of falters. Kiriel is made to be an offense style kind of card which is alright to an extent, but with Shamsiel being overwhelming superior as she fits the clan's theme easier, it kind of puts this to shame. Don't get me wrong though: Kiriel is still good. The Power Break allows her to swing in at 15000 by herself, and if there's a Bethnael or Clutch Rifle Angel behind her, then it all but promises either 15000 worth of shield or a Sentinel. As for her unique skill, you Counterblast 1 to call any face-up unit in your damage zone to the rear-guard which is pretty excellent as it allows you to call any of the Pegasus units, Bethnael, Barbiel, Calamity Flame or even Sunny Smile Angel to recycle your Heal Triggers easier. Namely, you'd want to get either of the Pegasus cards or Calamity Flame because of her drawback; you have to take the top card of your deck and put it in the damage zone face-down. This essentially makes her skill a Counterblast 2...much like the rest of the cards on this list, but since a card would be placed in the damage zone, the Pegasus cards and Calamity Flame would already be coming in at +2000. Overall, Kiriel is a decent enough card, but Shamsiel does her job in a much better way. Continuing our week of +5k vanguards, we have Circular Saw, Kiriel. Outside of the limit break, Kiriel has a skill that, much like the other cards reviewed this week, demonstrates with simplicity what the Angel Feather clan aims to do. Counterblast 1 when you ride Kiriel, call an Angel Feather from among your face up Angel Feather units in your damage zone, then place the top card of your deck in the damage zone face down. So, ultimately you get a unit to the field and 2 face down cards in your damage zone. Calling cards from damage is extremely limited, since there are only ever, at most, five to choose from, and your options for putting cards into damage to call later are equally as limited. Still, there are some good points to mention. Losing a good unit to damage is disappointing to any player, so the ability to use it again is helpful. In addition, moving the extra card from the top of the deck thins it slightly, which, in terms of statistics, is beneficial. 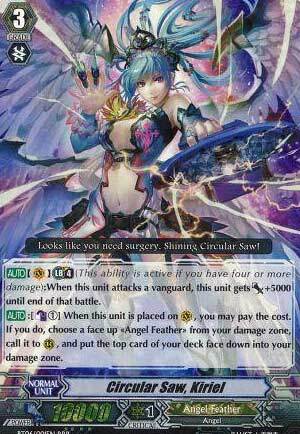 Also, adding another card to the damage zone lets you retrieve it later with cards like Battle Cupid Nociel. Kiriel lets you use the properties of Angel Feather, while setting up those same properties to be used later on. She also hits harder than Shamsiel on a regular basis. Rating: 5/5 – Potentially the most reliable Angel Feather vanguard.